In Korea, this is sold only on ‘Cosco’ like Walmart in the states. In inexpensive cotton buds it’s kind of rough texture however some people don’t feel it. However when you try this, there is a difference. Sometimes it said to be organic and it's soft but the cottons tear apart. Also the stick is important part of cotton buds. There are some made out of woods which it rough or plastic that easy to bend. However this isn’t made out of wood but it’s really strong stiff. I really love this cotton buds! There is tearing part at the back, but I use this by cutting the front part and standing against the wall. 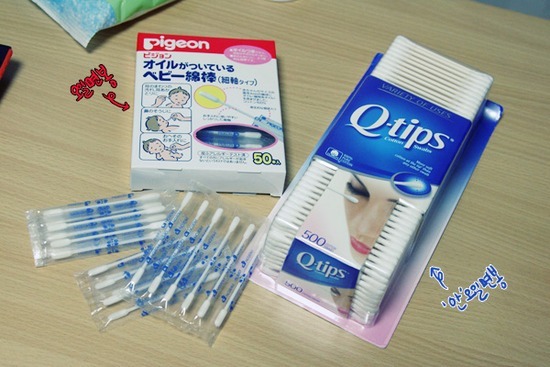 I can't really read Japanese but it said oil something baby cotton buds clearly. Yes this is for baby oil cotton buds. So this is really pure and no stimulation! At the end, about 4mm of plant oil at the end so use for cleaning, baby ear, nose, and belly button. However this is really good at removing waterproof products like eye line and eye shadow. Recommend to people who get easily smudge eye makeup. It removes clearly than using just regular cotton buds. So after using this cotton buds, apply some concealer or foundation than apply eye shadow according to your eye makeup routine. It perfectly cleans it like the eye makeup you put it on the morning. Also it’s packed in pieces so it’s sanitary. The tearing is from the middle but cut of the end part and safe the other side that lasts for a day. I always bring this oil cotton buds on my pouch. Also it’s important to put it on my makeup desk with other cotton buds and facial cottons. In removing eye makeup with the remover and cotton can’t erase all. So if you leave it, it will stimulate the eyes and as the time past it will destroy the skin around the eyes. 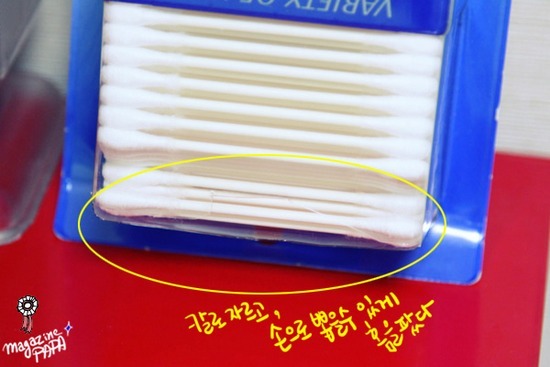 Thus using the regular cotton with some eye remover to erase the left over is fine but I have sensitive eyes so I like to use this baby oil cotton buds. After erasing the eyeliner between the eyelashes go straight to take a shower. 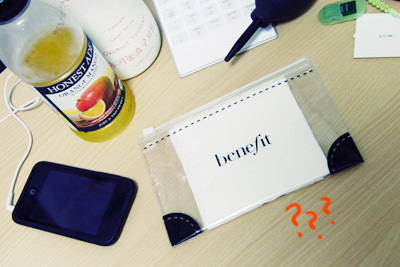 I can’t remember what I bought in Benefit but this is zipper bag. I think it was from sample pouch or something. Suddenly one day it caught my eyes in the drawer.. 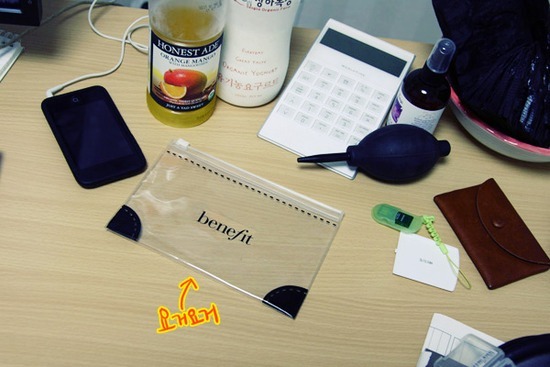 In daily life you can find this zipper bag. Also some tissue you can find in coffee shop or restaurant. With this I should I do??? Like the picture #1 open it and place other one on top only one side should overlap. In picture #3 put other one open top and fold it the other side. When you repeat this, it piles up. 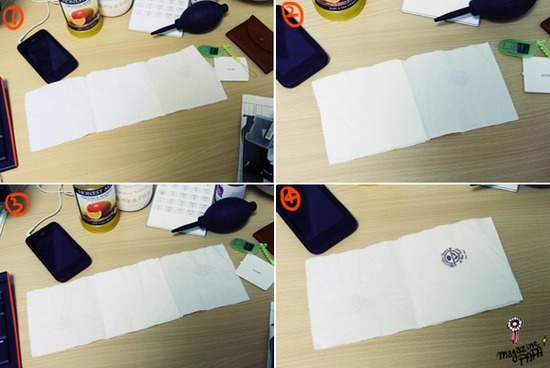 I think this is how the facial tissue in the box is folded. This is my tissue! Made by me!. The tissue comes out one by one. A knife cut the entrance of the tissue. So when there some tissue left on the coffee shop I put it in this zipper bag. However don’t really take so much tissue to just to make this. Damm my comment is gone after clicking publish!anyway, I'm typing it all again x( Heyyy I've been huge fan of your naver blog. How come you move into this secret place so quietly? I just randomly found your little shelter by googling. Are you planning to transfer to this blog permanently? Or is it just for refreshment? Haha even this blog is more up-to-date! Anyway, luv ya! hahah nice to meet you! No I am still continuing my naver blog. I am just transferring my review to this blog in English! So many more people could read my reviews and learn some knowledge! I hope. Thank you so much for long and honest comment!